Global specialty ingredients market is expected to undergo several changes such as increasing demand for natural specialty ingredients and introduction of new flavours. By application type, the global specialty ingredients market is segmented into food and beverage, nutrition and health and personal care. Food and beverage specialty ingredients is further sub divided into natural and synthetic category. The nutrition and health specialty ingredients is sub categorized into nutraceutical ingredients and active pharmaceutical ingredients where both the categories have been further subdivided into natural and synthetic type. Likewise, the personal care specialty ingredients is also been segmented into natural and synthetic categories. Geographically, the market has been segmented into North America, Europe, Asia Pacific, the Middle East, and Rest of the World. 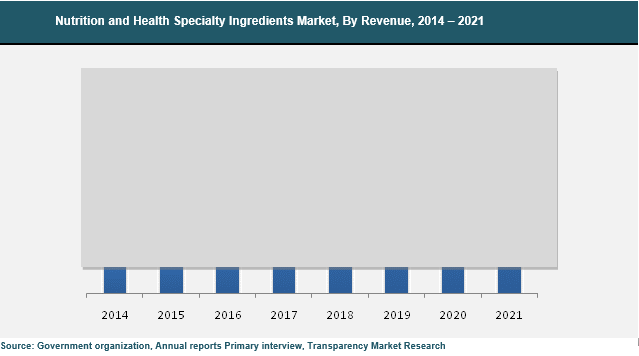 The global specialty ingredients market is primarily driven by factors such as growing health awareness among people, increasing income levels of consumers, and an augmented demand for anti-aging products. Rise in demand for food and beverage, nutrition and health, and personal care products has fueled the growth of specialty ingredients market. In order to preserve the flavor, nutrients, and freshness, specialty ingredients are used in food products as they help to prevent food wastage and extend the overall shelf life. In many situations, two or more specialty ingredients are used in food products to enhance food quality protection. The growing demand for packaged and processed food is stimulating the usage of food ingredients in the emerging markets. There has been an increase in the demand for personal care ingredients such as antioxidants, additives, antimicrobials, and other refined ingredients as a result of the increasing demand for personal care products. Moreover, increasing focus towards natural products among consumers coupled with their rising disposable income, offers high growth potential for the development of personal care products formulated with natural specialty ingredients in economies such as India, China, South Korea, and Indonesia. As chemical components are included in synthetic products, consumers are shifting towards natural products. Introduction of new specialty ingredients with natural elements is another key factor driving the sales of specialty ingredients globally. Therefore, people are shifting from synthetic products to natural products. Recent trends have shown that innovations driven by market needs and evolving consumer needs leading to product differentiation has fuelled the growth of the personal care ingredients market. Demand for natural specialty ingredients is expected to be high as consumers are shifting from synthetic to natural products as they do not contain harmful compounds. Moreover, due to the growing applications of skin care, hair care, cosmetics, bath products, and fragrances, the demand of natural specialty ingredients is expected to remain high in order to suit the specific needs of the consumers globally. However, different kind of stringent government regulations has created burden for the manufacturers to trade in the market. North America held the largest market share of specialty ingredients in terms of revenue in 2014 and is expected to continue its dominance throughout the forecast period. A growing consumer preference for natural ingredients in food, cosmetics, and health and wellness products has led to the increasing demand for natural specialty ingredients in this region The North America market is expected to be closely followed by Asia Pacific in terms of revenue throughout the forecast period. The specialty ingredients market on the basis of application is categorized into food and beverage, nutrition and health and personal care. Food and beverage specialty ingredients market is further sub divided into natural and synthetic category. The nutrition and health specialty ingredients market is sub categorized into nutraceutical ingredients and active pharmaceutical ingredients where both the categories have been further subdivided into natural and synthetic type. Likewise, the personal care specialty ingredients is also been segmented into natural and synthetic categories. The rise in the demand for food and beverage, nutrition and health, and personal care products.have fuelled the growth the global specialty ingredients market. In terms of application, specialty ingredients are used in food products to preserve nutrients, flavor, and freshness; thereby preventing food wastage. The increasing demand for packaged food has also led to the growth of food and beverage specialty ingredients market. Specialty ingredients are also being used in personal care products to increase the overall shelf life of the products. Some of the other key factors influencing the growth of the global specialty ingredients market are healthy economic growth, changing demographic profile, increasing disposable incomes, and changing consumer tastes and preferences among other factors. The global specialty ingredients market is expected to undergo several changes such as shift in the preference of the consumers towards natural specialty ingredients. At present, increasing awareness among consumers regarding natural products is growing as consumers are becoming more concerned about their health. As chemical components are included in synthetic products, consumers are shifting towards natural products and which in turn has resulted in increasing demand for natural specialty ingredients. Furthermore, recent trends have also shown, in order to attract more customers and to meet the changing consumer preferences, the manufacturers from the food and beverage sector are involved in the introduction of new flavors.. Addition of new flavors time and again has helped the market for specialty ingredients to grow at a considerable rate. The market for nutrition and health specialty ingredients is comparatively larger as compared to the food and beverage specialty ingredients and personal care specialty ingredients and is expected to remain so during the forecast period. Growing consumer awareness regarding health and the urge to maintain a proper balanced diet are the factors driving the market for nutrition and health specialty ingredienst. The report also provides an understanding of the value (USD billion) of specialty ingredients market. The study also provides forecast from 2015-2021 and highlights current and future market trends. The report also provides an understanding of company shares of specialty ingredients in North America, Europe, Asia Pacific, Middle East and Rest of the World. By Geography, the market has been segmented into North America, Europe, Asia Pacific, Middle East and Rest of the World. The countries included in North America are the U.S., Canada and others. U.K., Italy, Spain, France, Germany and Rest of Europe have been included in region of Europe. The countries included in the Asia Pacific region are China, India, Japan, India, Australia and Rest of Asia Pacific. Saudi Arabia, U.A.E. and Rest of Middle East countries are included in the Middle East region. Brazil, Argentina and others have been included among the Rest of the World countries. The report also provides the company market share analysis of key players operating in the specialty ingredients domain. The study in application type segment covers food and beverage, nutrition and health, and personal care. The key players operating in global specialty ingredients market are Archer Daniels Midland Co., CHR. Hansen Holding A/S , Cargill Inc., Naturex S.A., Ashland Inc., Koninklijke DSM N.V. Ingredion Incorporated and E. I. du Pont de Nemours and Company among others.